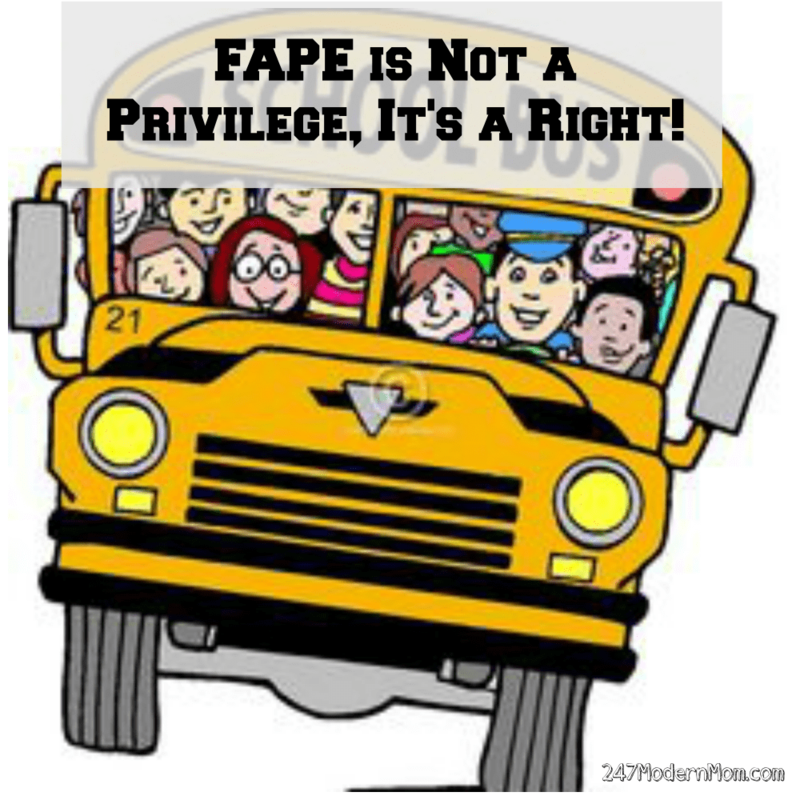 FAPE is an acronym for Free And Appropriate Public Education. FAPE is part of the Individuals with Disabilities Education Act (IDEA) The Act addresses two specific age groups requiring Special Needs Education: Part C is birth to age two and Part B is ages 3 – 21. While Preschool is currently not a legally required grade, (nor is Kinder in many parts), FAPE applies to Preschool because it addresses children of preschool age. The term, Appropriate, in part, means “Least Restrictive Environment.” If a child could function well in a General Class with the support of an Aide versus the more restrictive environment of a small Special Education Class, the child should be placed in the General Education class. If a General Education class cannot meet the educational needs of the child, the next least restrictive assignment should be made. While the IDEA has specific requirements, there is often conflict regarding the interpretation of the law(s), especially between school Districts and Parents. The specific needs of a Student are outlined in an Individualized Education Program,. (IEP) An IEP is a legal document. School Districts are required to comply with the IEP, regardless of budget deficits, lack of staff or programs. An IEP can be transferred to any school within the United States. The new school is required to comply with the existing IEP. However, they do have the option to reassess and/or request a new IEP meeting to propose changes. §300.17 Free appropriate public education. Prior Written Notice is a must! Parents must provide consent in order for the school district to assess their child(ren), even when the parent is the one initiating the request. When changes are made to an IEP or services are denied/removed, or altered in any way, the Parent must receive prior notification. Districts are not required to oblige Parents’ specific Education requests, but if a Parent feels strongly that a District’s actions fail to provide their child(ren) with FAPE, there is recourse. In my home state of California, we have Procedural Safeguards. The best way to protect your children’s rights is by knowing your Parents’ Rights! When seeking information on Parents’ Rights, it’s important to look for information Specific to YOUR State. In general, the strictest law(s) prevails. You’ll want to know which ones they are. For example, if a Federal Law is more lenient than your State’s law, the State law would prevail and your District would be held to the higher standard. Typically State Laws are more strict. States don’t often initiate laws that break Federal laws. However, a State may have some outdated laws which are less strict than newer Federal laws. In such case(s), the Federal Law would apply. In special cases, a county may have an even stricter law than the State. The same principle applies here. Many laws are born through state specific ACTS. The Lanterman Act is a well known and frequently referred-to Disabilities’ Act in California. In addition to Parents’ Rights, you should take time to research any State Disabilities Laws & Acts, as well as Department of Education Resources, Laws, and Procedures, including Administrative Hearing Procedures, Due Process Procedures, and other relevant inform such as how to request an Independent Education Evaluation. (IEE) Researching your rights can feel overwhelming. One thing I’ve found is that one resource often refers you to another. That can ease the burden many Parents feel when they are unsure of what to look for or even what questions to ask. A General Education Student with no disabilities may get sub-par grades their entire academic career. Perhaps there are hundreds, literally hundreds of things that can be done, with little impact on the teacher or the school, but no modifications or changes are made. The C Student is meeting the minimum standard. It’s not the schools’ job to help a student exceed standards. Legally, they have no obligation. A great teacher or terrific school might turn things around for a student. Unfortunately, those scenarios are typically exceptions to the norm. At the District level, Special Education can be reduced to a focus of compliance. Especially when there is conflict, the District may shift their focus to the legal requirements rather than how they can best support a student with Special Needs. Again, they are not required to give a student THE BEST. The truth is, they are required to give the student the minimum as is mandated by the law. AN ADVOCATE knows the law. An Advocate often knows the District’s strengths, weaknesses, and history. An Advocate does not work for the District. An Advocate will address the District’s failures to comply with the law, and use their knowledge to encourage the District to comply in a way that WILL allow the Student to excel, rather than meeting minimum requirements. An Advocate lets the District know the Parent means business, often without inducing panic in the District, prompting them to illicit their own additional support with attorney representation. An Advocate will write letters, attend meetings, and offer resources. Even if your Advocate is an Attorney, supporting you in the capacity of Advocate, can help reduce the tension and panic. An Advocate is usually passionate about Disability Rights in Education and makes every effort to find the quickest solution to meet not only the needs, but the potential of the Student. Advocates are often available as a low-cost or no-cost resource. While it’s important for a Parent to give the District some insight into the humanity of a Student instead of just a name on a piece of paper, it is equally important to maintain your Poker Face. Stick to the facts. If you need to cry, talk to a friend, scream in your car before an IEP meeting, or even after, but in the presence of the District, you are not just your child’s Parent who loves them more than anything in this world. You are their REPRESENTATIVE. If you are just starting your journey as the Parent of a Student with Special Needs, it’s easy to trust people who haven’t given you any reason not to trust them. Certainly, it’s a nice way to live but it rarely works when we are in the role of Representative for our child. Even for Parents who have been doing this for a while, it can get easy to become complacent. We can’t. Education for Special Needs Students is a legal issue. That sounds so cold but it’s the absolute truth. Maybe your child is in Kindergarten now. Perhaps everything is going okay. It’s early on in your Student’s academic career and you are trying not to rock the boat. You’re taking the wait-and-see approach. Perhaps your child is in an inclusion class right now and struggles with the transitions from one activity to another, but no one seems too concerned. Now imagine your same Student in the Third Grade, having to pull out a new book every thirty-five minutes, stay on task, and work independently without hesitation. If things fall apart, you’ll likely request an IEP Meeting. Maybe you think your child could benefit from an Aide. If the District doesn’t agree, and you have no proof of it ever being a concern, or your student ever even having issues with transition in their educational environment, the District may deny, stall, or counter your requests in a way that is damaging to the success of your child. The District may chalk it up to typical adjustment pains that “all” students experience as they transition into advanced grade levels with higher demands. You aren’t just your child’s representative right now. YOU WILL BE THEIR REPRESENTATIVE FOR THEIR ENTIRE ACADEMIC CAREER! You will constantly have to look ahead AND look back in order to understand and advocate what is best for YOUR child. Do NOT rely on Trust. Do NOT rely on Memory. Concerns, behaviors, changes, and conversations should be recorded. They should always include the FIVE Ws! As a former special education teacher and later a special education district supervisor for a large urban school district, I could not agree with you more. The parent must make themselves aware of state regulations and bring an advocate with them to IEP meetings.Parents are the ones who know a child best. When there are budget cuts, special education services are usually the first on the chopping block. I have seen so many parents overwhelmed by the system; becoming an advocate for a special needs child is just as critical as feeding and clothing him.